The best money for your money! 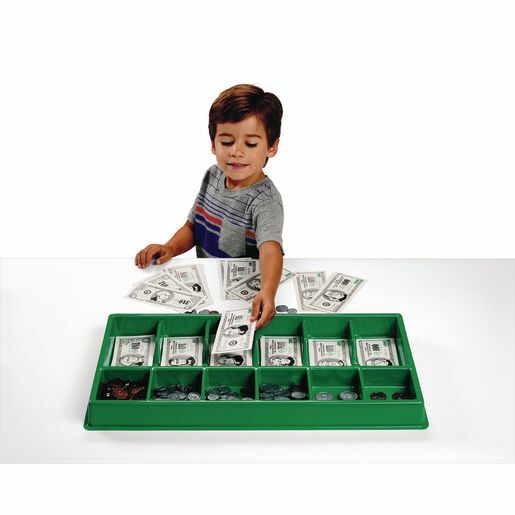 Our set features 220 realistic paper bills and 205 real-size metallic plastic coins in a durable bright green plastic tray with clear lid. 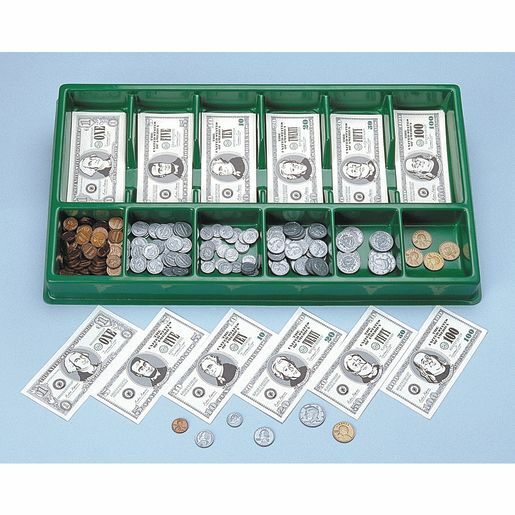 SOC (K) Understands the characteristics and functions of money and its uses. SOC (P) Understand the uses of money. K.CC.A.2. Count forward beginning from a given number within the known sequence (instead of having to begin at 1). 2.MD.C.8 Solve word problems involving dollar bills, quarters, dimes, nickels, and pennies, using $ and � symbols appropriately. Example: If you have 2 dimes and 3 pennies, how many cents do you have? 2.MD.D.10 Draw a picture graph and a bar graph (with single-unit scale) to represent a data set with up to four categories. Solve simple put-together, take-apart, and compare problems1 using information presented in a bar graph. K.MD.B.3 Classify objects into given categories; count the numbers of objects in each category and sort the categories by count. 1.MD.C.4 Organize, represent, and interpret data with up to three categories; ask and answer questions about the total number of data points, how many in each category, and how many more or less are in one category than in another.